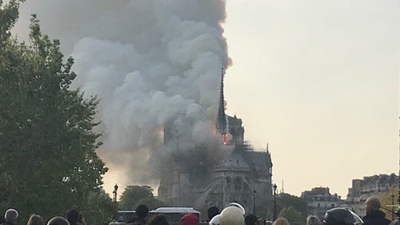 We just learned that the historic Notre Dame Cathedral in Paris has been engulfed in flames. Smoke from the building can be seen from any part of Paris. The monument is the most visited landmark in the city. We are hearing reports of ash and debris falling from the cathedral and flames coming out between the two bell towers. We're getting images and video from social media. The Notre Dame Cathedral wasa constructed in 1163.